Mineral makeup tends to attract followers of great dedication. Some people are almost evangelical in their adoration for their swirl, tap, buff methods that they leave my head spinning. I do count myself as a fan of most mineral foundations, I find them quick and easy whilst leaving behind pretty good skin! My biggest issue with them would be lasting power (or lack of! )… especially in the Summer and particularly on my nose! Enter Bare Minerals‘ new Prime Time Brightening Foundation Primer*. They already have a ‘normal’ primer on the market, this is the new one that promises to deliver an “extraordinarily luminous, healthy-looking glow” to our skins. It’s a very peachy-looking primer… I was expecting to see the usual, white or cloudy viscose liquid dispense from the pump. Instead, it’s creamy, sparkly and a little on the orange side! Eek! 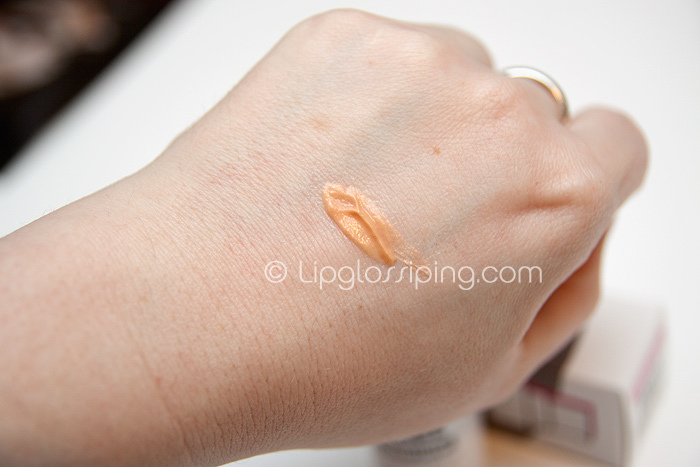 Well, the colour blends away into my skintone and doesn’t leave a trace behind… it has a slight silicone slip though not as much as primers like the Smashbox one. When I buff the foundation into my skin, I can definitely feel a difference in the application… it’s smoother and seems to give a little more glide to the buffing action. I’d even go so far as to say that I get a better finish than without the primer. But longevity? Nuh Uh… I’m not noticing a discernible difference. Not only that… but the “luminous, healthy-looking glow”? Well… that’s just a bit of sparkle. All over mah face. See the gold flecks? They sure are pretty! But they make me wanna break into Saturday Night Fever. They’re discoball… albeit subtle discoball once spread out over the face. 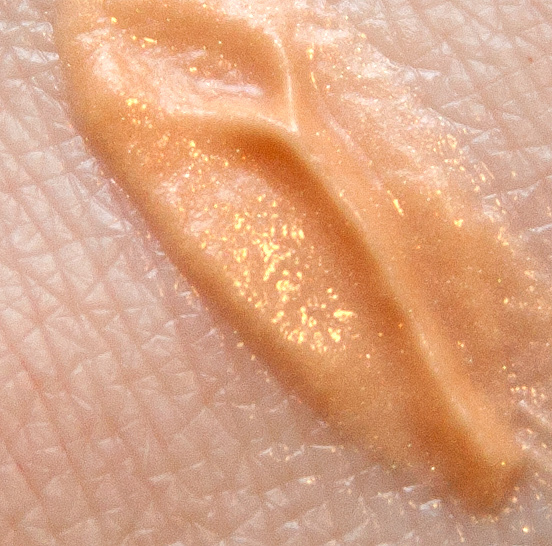 In any luminizer, I prefer subtle sheen over glittery particles. It’s not that the effect isn’t pretty… it is. It’s just too much for daywear, for me at least. Little primer. we can’t stay together, I’m sorry. It’s not you… it’s me. 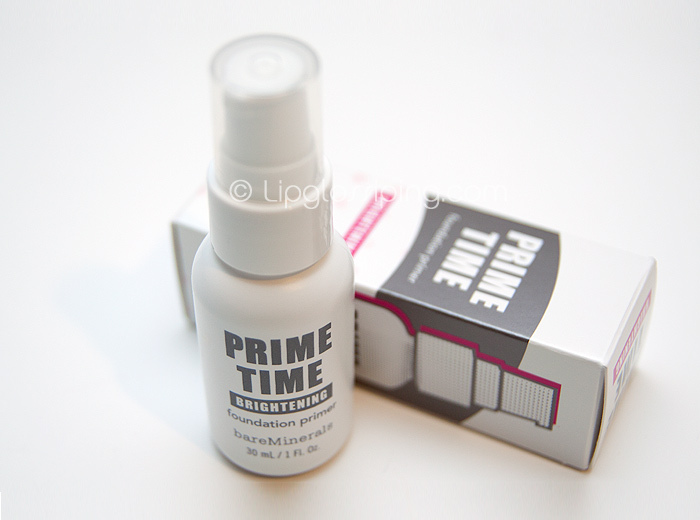 Bare Minerals Prime Time Brightening Primer is available from this month at Bare Escentuals Boutiques, department stores and selected spas/salons nationwide priced at £19.00. Lol, great review 😛 “Mah face”. I have yet to find a primer I can believe in, most of them feel nice etc but don’t really do much. I love mineral foundations (when I first started using them it was kind of like magic the way they blend) but the longevity is an issue so I chop and change between mineral and liquid variants. I have recently been trying Lily Lolo and it seems to hold up a bit better throughout the day. I agree, i do not want a glittery face, it would make a stunning eyeshadow colour though!